I like the term Release Candidate and the phrase first retail delivery! I would like to see an estimated production schedule that maps pre-order numbers to some rough time frame, by quarters would be a minimum. They should have a handle on this by now. 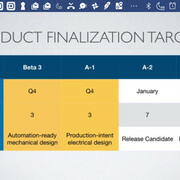 (11-17-2018, 06:25 PM)ricschug Wrote: I would like to see an estimated production schedule that maps pre-order numbers to some rough time frame, by quarters would be a minimum. They should have a handle on this by now. It seems to be taking more time than I anticipated to roll out the first A-Series. The end of Q4 is rapidly approaching.......or was the release date January 2019? Regardless, I’m getting older and apparently growing less patient. They did say 6 weeks, which would make their deadline Christmas... but I'll bet the intent was to have them done by the end of the year. (12-09-2018, 08:11 PM)Kepesk Wrote: They did say 6 weeks, which would make their deadline Christmas... but I'll bet the intent was to have them done by the end of the year. Errr.....I wonder who gets the one made right after the Christmas party? I noticed on Arcimoto’s website spec sheet the FUV color is pictured as black and the assembly line FUVs are black. I’m assuming the $11,900 base model is black since color is listed as an option. I was told that the bodies are black plastic (ABS perhaps) and decals are added for color for about any design that the customer wants. This matches with what I have seen in photos. Of course I guess you could nix the decals and have a nice paint job done after purchase. My early on understanding was that there would be a limited number of color-molded directly in the body panels on the base model with the option of custom colors and/graphic wraps. There was a color selection choice on one of the earlier FUV reservation tabs. Black is not an option for me and I wonder about the impact of pressure washing, rock chips, fading, and the long term wear factor of solid color or graphic body panel wraps and color will apparently bump the base price.